We Demand a Referendum Conference! 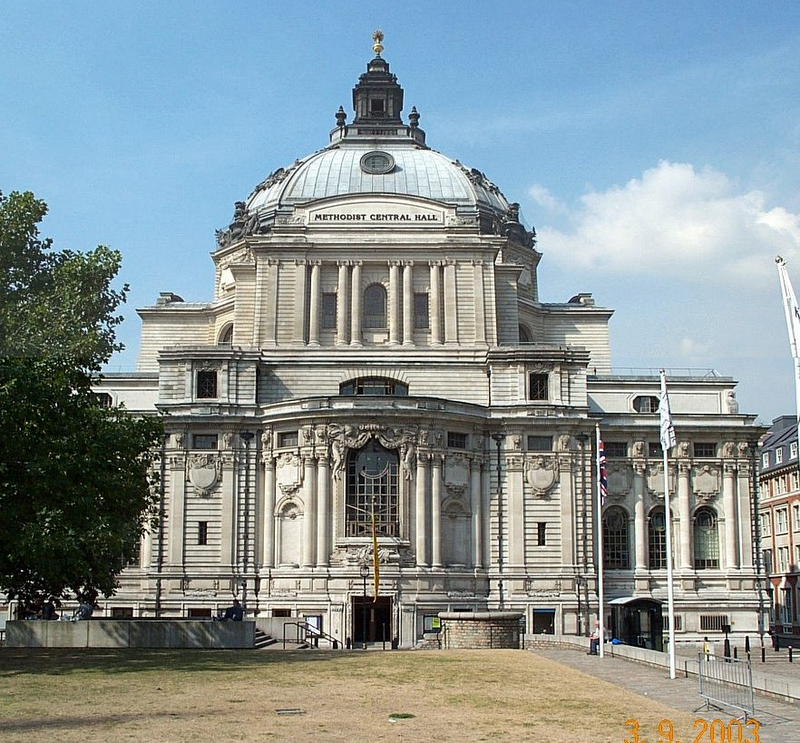 We Demand A Referendum is pleased to announce its inaugural conference at Central Hall Westminster. Further meetings across the country will be held and announced in due course. Marta Andreasen has been increasingly vocal in her criticisms of Nigel Farage's leadership. She rightly fears that he will replace her as his running mate when it comes to selecting the new list for the South East. She gave a rather illuminating conference interview to Micheal Crick of Channel 4. She pointed out that Farage has total control of the selection of MEP candidates. Farage lamely countered that the NEC would select the final list of candidates. Mr Crick rightly pointed out that Farage controlled the NEC and therefore controlled the lists! We would advise both Marta Andreasen and Gerard Batten to start looking for alternative employment as their days as UKIP MEPs are numbered. And we would advise members to create hell over the list system. 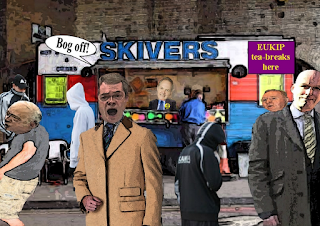 Farage already has his favoured candidates ready to take the number one and two slots. So the choices of the regional membership will count for nothing! And yes, the NEC will do as they are told. And ignore Farage's claim that the changes to the MEP list system are to ensure that candidates like David Bannerman and Marta Andreasen are never chosen again. Has he forgotten that these candidates were his favoured choices? Has he forgotten who rigged the selection to ensure they were picked? Farage is the one who should kept away from the whole selection process! An excellent appearance by Katie Hopkins on the Daily Politics. And how we laughed at the odious Paul Nuttall's failed attempts at point scoring! Nikki Sinclaire on that divorce! Having been politically active since my schooldays, I have always been hugely concerned by the undemocratic nature of the European Union, and the way in which successive governments have managed to keep us ill-informed and in the dark about what our membership really means. It was this that led me to become involved with UKIP in 1994. I never do things by half, and so I threw myself into campaigning work. I must have walked a thousand miles of pavement, and delivered more leaflets than I could count. 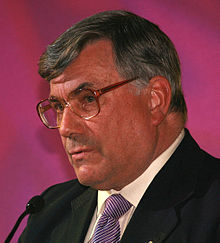 I wrote letters, helped run the party's head office, raised (and donated) large sums of money, and worked alongside Mike Nattrass when he was elected to the European Parliament in 2004. In 2009 I joined him in Brussels as an MEP, full of pride and ready to fight. But then things turned sour. I have always been a passionate defender of human rights and individual liberties. Imagine my horror when I realised that for reasons of financial benefit UKIP had formed a political group in the parliament that contained some of the vilest far-right elements in European politics. I was expected to sit alongside convicted racists, homophobes, and holocaust deniers. One of our new allies, an Italian, had a criminal record that included convictions for a racially motivated assault on a child and for setting fire to the belongings of a homeless immigrant who was sleeping under a bridge. He had also been filmed encouraging fascists to infiltrate mainstream political organisations. My protests were ignored. Nigel Farage, the UKIP leader, was co-president of this group and as such he had helped to form it. I was horrified when the editor of a Brussels magazine told me he would not report my work in the parliament because I was a member of a far-right group. I realised that my association with such elements was damaging my political credibility. None of this seemed to concern the party leadership. Eventually I had enough, and I resigned from this group, hoping that I could work better as a non-attached member of the Parliament. Then it really started. Nigel Farage appeared on the BBC stating that I had not resigned, but that I had been expelled and that I had the party whip removed from me as I had failed to reveal that I was a bankrupt. This was an absolute lie, and I was horrified to hear it. The party sent people into my office to seize computer equipment and the police had to be called. I felt that the party had betrayed my principles, and was trying to put the blame on me. Of course, my crime was to speak out, and I was being punished for it. It is surprisingly hard to leave a relationship, even when it has been abusive, but eventually I did make the break and am no longer a member of the party that I had come to regard almost as a family. Friends turned their backs on me, and lied about me. I started to question whether all the work I had done was in vain, and grieved over broken dreams and aspirations. Soon, Mike Nattrass and another UKIP MEP, Trevor Colman, also resigned from the group, and joined me. 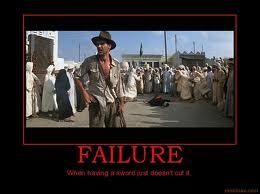 I felt vindicated. Then a fourth MEP resigned from UKIP and joined the Conservatives. It was all starting to fall apart in Brussels. As I began to find my feet outside UKIP I realised how much I could do. 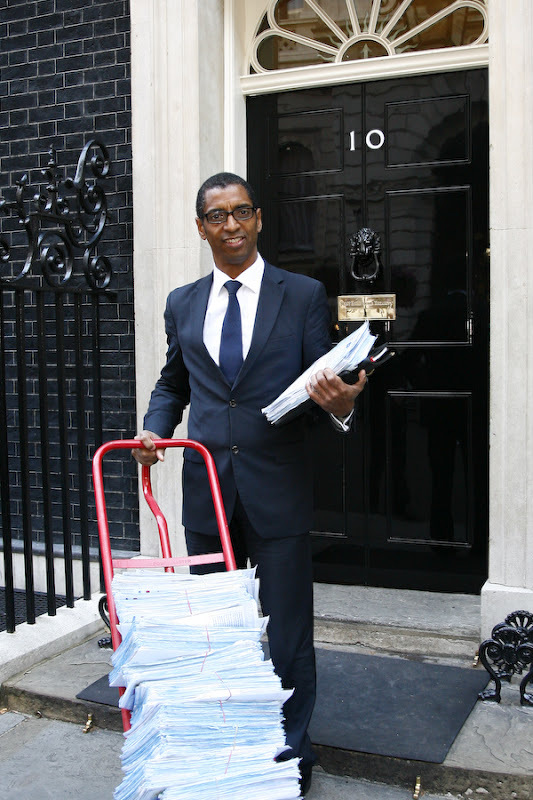 I launched a petition for a referendum on Britain's continued membership of the EU, and have delivered 220,000 signatures to 10 Downing Street in the space of less than a year. I have become increasingly involved in community issues, and in human rights matters. My petition forced a debate in the House of Commons and provoked the biggest back-bench revolt the government has seen. When I look behind me, at the people I walked away from, I see one of them praising the ideology of the Norwegian gunman Breivik, and I shake my head in disgust. I feel sad at what UKIP has become, and I feel sorry for all the good people who are being let down. But the most important thing is that I am able to get on with doing what I was elected to do. Forget all the spin about UKIP replacing the Lib Dems! Forget all Farage's bluster about how well UKIP is doing! Forget the opinion polls and just check out the latest election results. See the reality for what it really is! UKIP is going nowhere under Farage. UKIP is now a total irrelevance in British politics. Canterbury City - Blean Forest: C 342, Lab 185, Lib Dem 121, Green 64, Ukip 38, Ind 24. (May 2011 - Two seats C 626, 568, Green 400, 300, Lib Dem 184, 173). C hold. Swing 4.2% C to Lib Dem. Cornwall County - St Keverne and Meneage: C 585, Lib Dem 279, Ukip 141, Lab 52. (June 2009 - Ind 673, C 657, Ind 356, Lib Dem 127, Ind 67, Lab 33). C gain from Ind. Swing 0.5% Lib Dem to C.
Nottinghamshire County - Rufford: Lab 1557, C 660, Notts Ind 346, Ukip 123. (June 2009 - Ind 1309, C 1259, Lab 1109). Lab gain from Ind. Swing 18.7% C to Lab. Scarborough Borough - Esk Valley: C 606, Ind 151, Lab 87, Ukip 35, English Democrats 18. (May 2011 - Two seats C 1183, 928, Ind 417, Lab 379). C hold. Swing 10.7% Lab to C.
And UKIP couldn't even find a candidate for this one! Herefordshire County - St Nicholas: It's Our County 608, Lib Dem 222, C 204, Lab 104. (May 2011 - Two seats It's Our County 821, 607, C 423, Lib Dem 320, 312, C 279, Lab 273). It's Our County hold. Swing 1.8% C to Lib Dem. Ex-UKIP leader joins new party! On the eve of the UKIP conference, a former party leader has defected to a new pro-Referendum movement. Roger Knapman, former Conservative MP for Stroud, lead the parties breakthrough in the 2004 European election where UKIP came third. His defection to the newly established "We demand a referendum party" was announced on the day when UKIP deputy leader Paul Nuttell admitted that the new grouping was a threat to their own election hopes. 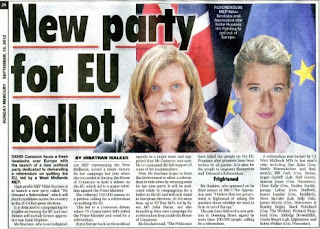 The new party has been founded by high profile MEP Nikki Sinclaire and former Apprentice star Katie Hopkins. 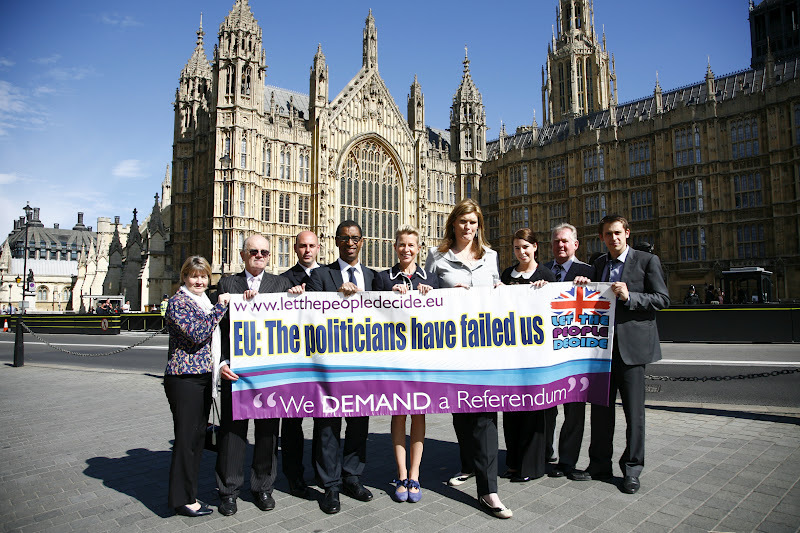 The ´We Demand a Referendum´ Party has vowed to stand in every seat in the European Elections of 2014 unless David Cameron calls an In/Out referendum by 1 Jan 2014. A YouGov Poll on 4th to 5th Sept´ showed a third of the electorate would or probably would vote for such a single issue party. Roger Knapman said "Now is the time to force a referendum with our country's continued membership of the European Union. We eurosceptics have won all the arguments. In or Out that is the only question that has to be answered now." 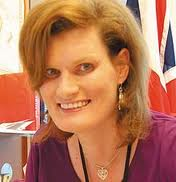 Roger added "I am very happy to give my full support to this initiative, established parties, including UKIP have failed to deliver, and it is time for the People to Demand a Referendum"
Party Chairman, Nikki Sinclaire MEP said "We are delighted to have someone of Rogers's calibre on board. His experience will be invaluable to achieving our aims." All aboard the UKIP Circus! And so UKIP conference time is upon us again! 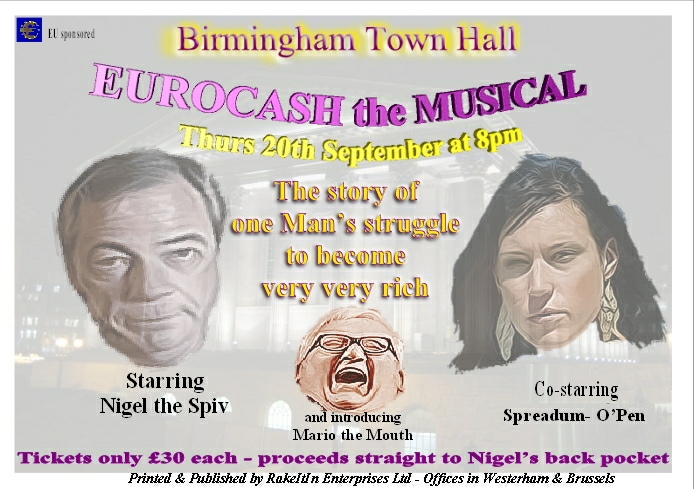 This year, Farage has picked sunny Birmingham for his usual Fuhrer fest. And you can expect the usual band of failed ex-Tories and Z-list celebs to make up the numbers. Enjoy! That UKIP is an irrelevance in British politics is evident to all but the most blind. And changing the party logo or even the party name won't help stop the rot as long as Farage and his corrupt followers are in control. And nor will recruiting another failed ex-Tory lord add any lustre to Farage's tarnished and corrupt vehicle for keeping him on the EU Gravy Train! Lincolnshire County - Nettleham and Saxilby: C 1026, Lib Dem 600, Ukip 266, Lab 257, Lincolnshire Ind 196, English Democrats 21. (June 2009 - Lib Dem 2012, C 1129, Lab 184). C gain from Lib Dem. Swing 22.2% Lib Dem to C.
South Gloucestershire Council - Dodington: Lib Dem 787, Lab 243, Ukip 213, C 139. (May 2011 - Two seats Lib Dem 1340, 1324, C 452, 429, Lab 294, 285). Lib Dem hold. Swing 5.6% Lib Dem to Lab. West Lindsey District - Nettleham: C 565, Lib Dem 513, Ukip 177. (May 2011 - Two seats Lib Dem 1238, 1108, C 804, 559). C gain from Lib Dem. Swing 15.3% Lib Dem to C.
So much for Farage's claim that UKIP has replaced the Lib Dems as Britain's third party! 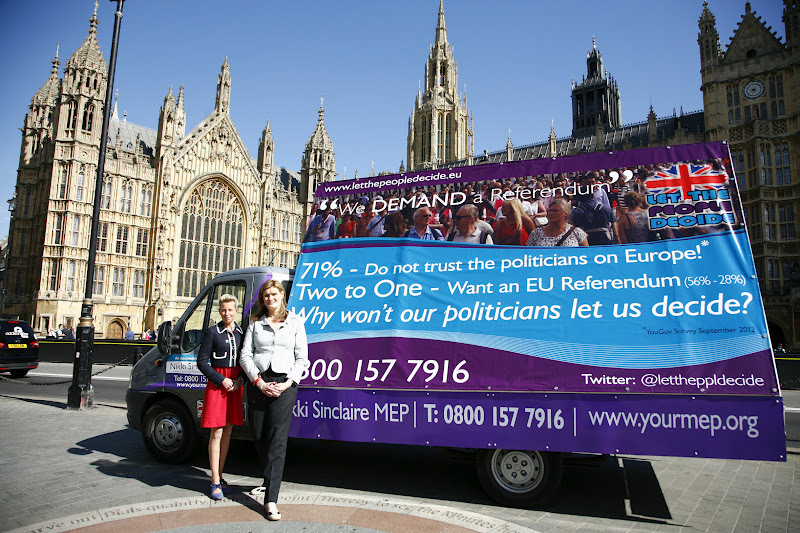 We again urge all UKIPPERS to abandon UKIP and join Britain's newest party - We demand a Referendum. New Referendum Party featured in the Sun! It has also been featured in The Sunday Mercury. Excellent news! So now the British people have a real alternative to Farage's corrupt EUKIP! We would urge all UKIPPERS to abandon Farage's sinking ship and join the We Demand A Referendum Party at the earliest opportunity! At last! A real alternative to Farage's UKIP! 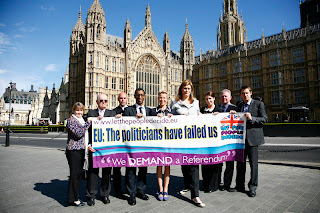 A NEW A new political movement has been launched to allow British people the opportunity to demand a referendum at the European Elections in 2014. It comes in the wake of a YouGov opinion poll that shows a third of UK adults said they would ignore party loyalty to vote for an entity whose sole manifesto was to urge for a straight forward In-Out referendum. The movement has been registered with the Electoral Commission as “We Demand a Referendum” and will carry the slogan imbedded in the emblem from Jimmy Goldsmith’s Referendum Party of “Let the People Decide”. 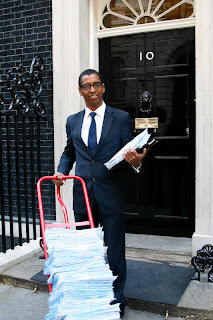 “We Demand a Referendum” has been set up by the Campaign for a Referendum team that delivered two petitions totalling more than 220,000 signatures to Downing Street and also forced a parliamentary debate last year that led to a huge Tory rebellion. It is a single-issue political body that challenges David Cameron to call an In-Out referendum by 2014. A YouGov poll last week showed that 65% of Tory voters want a referendum – much more than the average of 56% from all voters. “We Demand a Referendum” will be fielding candidates in every region of the country and could take between eight and 22 seats in the European Elections, according to the YouGov poll commissioned by the body’s chairman - West Midlands MEP Nikki Sinclaire. One of those candidates will be former Apprentice star Katie Hopkins who will be the lead candidate in the South West. Katie will need only 10% of the vote to be elected under the system used in the election. All candidates will share a single aim - to force a decisive referendum on the issue of Europe by sending a strong message to the government ahead of the General Election in 2015. 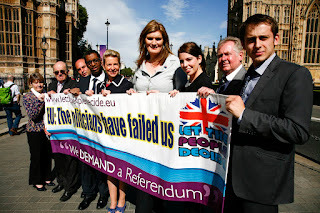 “The Politicians have failed the people on the EU,” said Nikki Sinclaire. “Promise after promise has been broken by all parties and it is time for the people to empower themselves and demand a referendum! TV personality and businesswoman Katie Hopkins added: “Sometimes tough questions have to be asked. “I often hear people say 'I didn't ask because I was frightened I might not like the answer' and I think this is true for the referendum on Europe. Katie added: “The importance of forcing an EU referendum is far bigger than any party. We strive to go beyond party politics and, as our campaign slogan says, we want to Let the People Decide!" 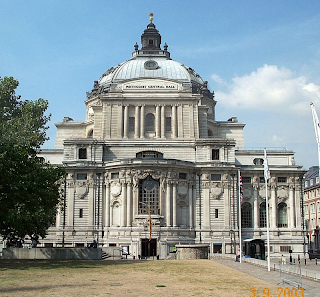 We Demand a Referendum will hold its inaugural conference at Westminster Central Hall in London on Friday October 5. 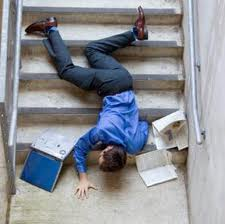 UKIP MEPs have been attacked for their laziness in the European Parliament. What Chris Davies probably does not realise is that UKIP MEPs use the tactic of non-engagement in order to cover up the fact that they simply don't understand what is going on. Can you imagine Derek Clark, for example, taking an active part in any meaningful debate? 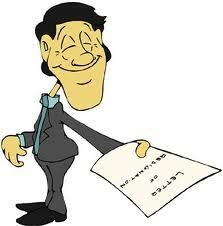 They all seem to get the bit about signing in for allowances, but beyond that not much happens. 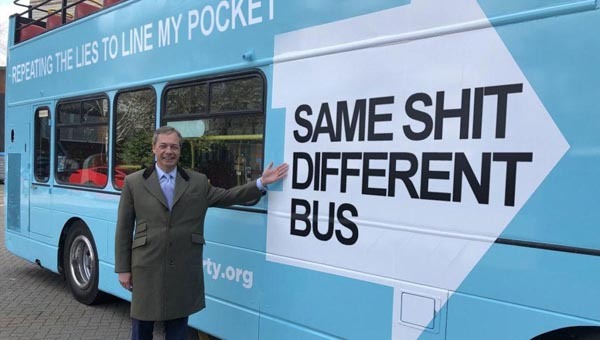 How amusing it was to see Nigel Farage Tweeting the fact that it took him 23 hours to get from Hong Kong to Strasbourg as a way of denying that he is lazy. No, he would have travelled, probably by first or business class, as the European Parliament allows for that, by airliner. We note that Chris Bruni-Lowe - UKIP's campaign manager - has resigned after being the subject of a smear campaign led by Lisa Duffy. Ms Duffy couldn't stand the thought of someone actually competent doing the job and saw Mr Bruni-Lowe as a threat to her position in the party. The allegations made against Mr Bruni-Lowe include having a fling with Annabelle Fuller. Farage was less than pleased when told this and had the usual hissy fit. Nigel likes his mistresses to stay loyal to him! We wish Mr Bruni-Lowe the best of luck in his future endeavours. He is currently engaged to Lord Pearson's daughter. Katie Snape has also quit UKIP. She was a UKIP press officer and former Sky News employee. She has gone on record as stating that working for UKIP was like working for a circus. She now looks to work for a more professional organisation. Nikki Sinclaire continues to Battle for Britain! And once again Nikki Sinclaire puts Farage and his sycophants to shame! 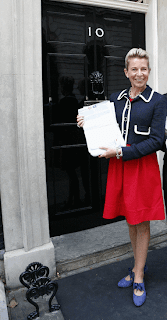 Another 100,000 have now signed her petition for a referendum on the EU! And what has Farage done in comparison? He has brought the euro-realist cause into disrepute by getting drunk and collapsing into gutters, promoting sycophants, living it up at the taxpayer's expense and using party funds to pursue vendettas against members. But Farage is never one to forget a slight. Today, Mr Hardy was to face a UKIP kangaroo court in London. Farage claims that Mr Hardy sent a letter to a newspaper in which he attacked Gordon Parkin, a fellow UKIP member. My Hardy denies this and UKIP have failed to provide a copy of the letter. Mr Hardy wisely decided not to attend after being advised that Farage was determined to kick him out of UKIP regardless of the cost. My Hardy has threatened legal action if they expel him. So once again Farage is willing to use party funds to pursue a vendetta against a member who has the audacity to stand up for his rights! UKIP is now an irrelevance in British politics. Indeed, it is a hindrance to the euro-realist cause. It soley exists to keep Farage and his sycophants on the EU Gravy Train. It is interesting to note that UKIP's Corby by-election candidate - and wannabe MEP - has been a lobbyist in the EU. What it is: Advice and information on EU legislation for industry and Businesses. Who Does it? Margot Parker: Fellow of the British Promotional Merchandise Association. Who is Margot? 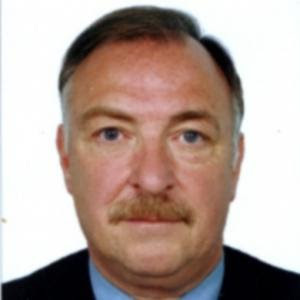 Margot is a Director of Eurocom-Consult, a well-known and respected figure in EU parliamentary and lobbying circles, particularly in relation to the promotional, marketing, food and fragrance industries. In her roles as a past Director of EPPA (European Promotional Products Association) and the BPMA (British Promotional Merchandise Association’s) spokesperson on Europe. 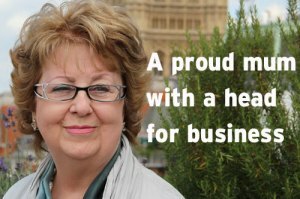 Margot became involved with the European Parliamentary system in a lobbying capacity for the BPMA. Margot now consults in her areas of expertise. in depth research on European issues using personal contact and information not readily available to the general public. Presentation to interested groups or associations on current or impending legislation. One must question Ms Parker's commitment to leaving the EU. She is desperate to become an MEP and join Farage on the Gravy Train for a start. Turkeys don't vote for Christmas! And how can the electorate have full confidence in a 'euro-withdrawlist' who makes money out of advising others on how to make money out of the EU!